HarperLove became the industry leader in R&D the old-fashioned way. We earned it through the development of innovative products that improve our customers’ operations. Today our R&D, led by full-time chemists and engineers, offers a broad range of capabilities. We conduct pure research, emulate bonding situations, develop new products and formulations, conduct quality control and product testing, and develop certificates of analysis. We also offer our testing laboratory as a service to our customers. 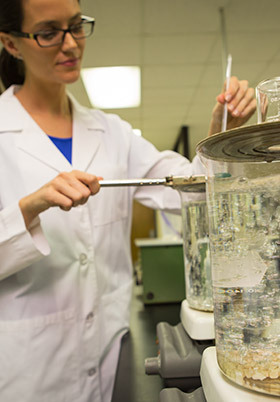 In our labs, we evaluate customer-provided board and paper samples to determine what will provide a superior bond. We also develop customized testing based on specific customer needs, accurately emulating customers’ production environments and processes. Testing is conducted on a combination of industry-standard test equipment and our own custom-designed equipment.